EXCLUSIVE Let your Valentine know she holds the key to your heart. 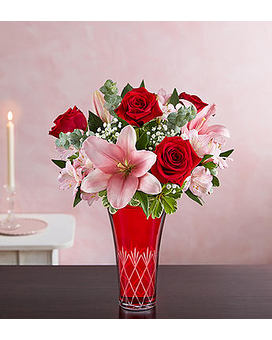 Our romantic arrangement is hand-gathered inside our elegant, new, ruby red keepsake vase. Etched with a unique diamond-cut pattern, this exquisite design enhances the beauty of each bloom while reminding her that, like a diamond, your love is forever.